The Israeli Information Center for Human Rights in the Occupied Territories, B’Tselem, announced Wednesday that they will stop working with the Israeli military law enforcement unit, which is supposed to handle complaints filed against soldiers for harm caused to Palestinians in the West Bank, but which, according to B’Tselem, is instead used to whitewash Israeli war crimes. The role of the military law enforcement system has been narrowly defined to begin with: it investigates only specific incidents in which soldiers are suspected to have acted in breach of the orders or directives they were given. The system does not investigate the orders themselves nor the responsibility of those who issue them or determine the policy. As such, the system is oriented toward low ranking soldiers only, while senior military and government officials, including the Military Advocate General (MAG), are absolved in advance of any responsibility. In this state of affairs, even if the system had fulfilled its tasks, its contribution to law enforcement would still remain limited. However, an examination of the operation of the military law enforcement system indicates that it makes no attempt to fulfill even this limited mandate. Ever since B’Tselem was established more than 25 years ago, it has applied to the MAG Corps regarding hundreds of incidents in which Palestinians were harmed by soldiers, demanding the incidents be investigated. Some of B’Tselem’s applications led to the launching of criminal investigations. In many cases, B’Tselem assisted investigators in making arrangements for them to collect statements from Palestinian victims and eyewitnesses, and by obtaining medical records and other relevant documents. Once the investigations were concluded, B’Tselem followed up with the MAG Corps to get information as to the case outcome. In some cases, B’Tselem appealed the MAG Corps’ decision to close a case, and in a few instances, even petitioned Israel’s High Court of Justice (HCJ) against a decision to close a case, or regarding unreasonable delays in the MAG Corps’ processing of a case. Since the second intifada began in late 2000, B’Tselem has demanded an investigation in 739 cases in which soldiers killed, injured, or beat Palestinians,used them as human shields, or damaged Palestinian property. An analysis of the responses B’Tselem received as to how the military law enforcement system handled these 739 cases shows that in a quarter (182) no investigation was ever launched, in nearly half (343), the investigation was closed with no further action, and only in very rare instances (25), were charges brought against the implicated soldiers. Another thirteen cases were referred for disciplinary action. A total of 132 cases are still at various processing stages, and the MAG Corps was unable to locate 44 others. On their own, these numbers do not necessarily mean there is any problem with the way the military law enforcement system operates, but the figures on how the system handles complaints of harm to Palestinians by soldiers must be viewed in a wider context. How does the military law enforcement system operate? Over the course of more than 25 years of operation, we have gathered information from hundreds of complaints B’Tselem filed with the military law enforcement system. In addition to the vast amount of information collected with respect to the processing of these cases, over the years B’Tselem has requested and received scores of investigation files from the Military Police Investigations Unit (MPIU). B’Tselem staff members have also met with officials inside the military law enforcement system dozens of times over the years, and corresponded at length with the MAG Corps and other military officials. All this information has helped B’Tselem gain a great deal of experience and given it vast and detailed organizational knowledge regarding how the system works and the considerations that guide it. With MPIU investigations conducted negligently, investigators cannot get at the truth. Almost no effort is made during the investigation to collect external evidence, the system citing as an excuse difficulties of which it has been aware for years and which it has made no attempt to resolve. Instead of evidence, investigations rely almost exclusively on statements collected from soldiers and Palestinians. Nevertheless, the investigation files show that MPIU investigators are hard put to collect these statements, which are often obtained only months after the incident. At witness statement interviews, investigators function more like stenographers taking dictation than staff tasked with uncovering the truth. This is the case even when soldiers’ statements are found to contradict the accounts given by other soldiers or by the complainants. The investigation file is transferred to the Military Advocacy for Operational Affairs, which is guided by considerations that almost inevitably dictate closing the file with no further action. Many cases are closed for “absence of guilt”, since the MAG Corps simply assumes that the accounts given by soldiers suspected of committing an offense are reliable – usually with no supporting evidence. In addition, the decision of the MAG Corps – which accompanies the investigations from the very start and oversees them – has done nothing to improve or make them more rigorous, instead finding the lax MPIU investigations sufficient for making decisions in cases. Under these circumstances, the fact that many cases are closed for absence of evidence is no surprise. Since no serious effort is made to obtain evidence, it clearly could not support a criminal case. In many other cases the Military Advocacy for Operational Affairs elects not to launch a criminal investigation at all. Sometimes, it justifies its decision on the grounds of “absence of guilt”. Here, too, it does so on the basis of soldiers’ accounts of events. Sometimes, in cases in which there are Palestinian fatalities, the grounds are that the deaths were in “combat situations”, an exclusion that grants sweeping immunity to soldiers from criminal investigations, far above and beyond that granted by international humanitarian law. The military law enforcement system also draws legitimacy from the ostensible existence of oversight mechanisms within the civilian system in the form of the Attorney General and the Supreme Court, saying they are meant to oversee the work of the MAG, who wields extensive authorities, as well as the work of the MAG Corps as a whole. However, the Attorney General elects to delegate most of his powers to the MAG and refrains from intervening in his decisions. As for the Supreme Court, it is not meant to serve as an oversight mechanism, and in the few cases in which it was asked to do so, for the most part it preferred not to intervene. The military law enforcement system is plagued by a host of issues in the basic way it is run: The system is inaccessible to Palestinian complainants, who cannot file complaints with the MPIU directly and must rely on human rights organizations or attorneys to file the complaints on their behalf. The processing of each complaint lasts months, and even years, so that often enough soldiers who are the subject of the complaint are no longer under military jurisdiction. Both the MPIU and the MAG Corps act without transparency, and getting information from them – both about a complaint filed, as well as with general information about their work – requires repeated requests. This is the system that officials bring as proof – to Israel and the world – of their claim that the military does everything in its power to investigate complaints against soldiers responsible for harming Palestinians and to prosecute the offenders. Top officials boast of the system’s effectiveness and values, discounting any substantive criticism, despite the fact that the system’s operation and the outcomes of its work are well known to senior officials both inside and outside the military. While changes have been made to the military law enforcement system over the years, they mostly served to reinforce the impression that efforts were being made to get at the truth, and did not resolve the system’s substantive problems. The deliberations and recommendations of the Turkel Commission ought to be considered against this backdrop. The Commission, which published its conclusions already three years ago (February 2013), recommended a number of improvements to the military law enforcement system. The following were among the Commission’s recommendations: amendments to legislation that would include legislation against war crimes and address the criminal responsibility of commanding officers for the actions of their subordinates; improving MPIU and MAG Corps work methods – including setting shorter schedules for processing time; establishing an MPIU unit designated for handling complaints by Palestinians; greater transparency in the work of the MAG Corps; and a number of measures meant to enhance the MAG’s independence. The implementation of these recommendations, which has already begun, may improve appearances of the current system, but it will not remedy the substantive flaws plaguing the military law enforcement system. After the Turkel Commission published its recommendations, the government appointed another committee to implement them – the Ciechanover Committee, which submitted its own recommendations in August 2015. In its report, the Ciechanover Committee advocated the implementation of some of the Turkel Commission recommendations verbatim, stated that the implementation of others would require allocation of additional resources, and suggested some minor changes in yet other recommendations. The Ciechanover Committee concluded by stressing that its report is not the final word on the subject, and that some issues still require more work. It recommended the establishment of another agency that would follow up on the implementation of its recommendations. And so, report after report, committee after committee, the discourse in itself creates the illusion of movement toward changing and improving the system. This illusory movement allows officials both inside and outside the system to make statements about the importance of the stated goal of enforcing the law on soldiers, while the substantive failures remain as they were and most cases continue to be closed with no measures taken. Among other things, the semblance of a functioning justice system allows Israeli officials to deny claims made both in Israel and abroad that Israel does not enforce the law on soldiers who harm Palestinians. In so doing, the state ensures that the military law enforcement system will remain in the sole purview of the military. The military, in turn, will be able to continue its investigation policy in which only the junior ranks are (ostensibly) investigated, while senior commanders and civilian superiors are absolved of accountability for unlawful acts committed under their authority. These appearances also help grant legitimacy – both in Israel and abroad – to the continuation of the occupation. It makes it easier to reject criticism about the injustices of the occupation, thanks to the military’s outward pretense that even it considers some acts unacceptable, and backs up this claim by saying that it is already investigating these actions. In so doing, not only does the state manages to uphold the perception of a decent, moral law enforcement system, but also maintains the military’s image as an ethical military that takes action against these acts (defined as “aberrations”) and even has an extensive, professional system for doing so. Effective investigations that get at the truth are critically important. For the victims and their loved ones such a system would mean getting justice, in that action would be taken against those responsible for death and injury.An effective law enforcement system will also serve the public interest by deterring soldiers and officers from committing similar offenses and preventing future harm. This is why establishing legal liability and accountability for human rights violations is the core of the activities of human rights organizations both in Israel and abroad. And so, for 25 years, with a view to establishing accountability and preventing future harm, we contacted the military law enforcement system and demanded that soldiers suspected of harming Palestinians be investigated. Over the years, the military law enforcement system has developed the expectation that human rights organizations, including B’Tselem, serve as subcontractors for the military investigative system: that they submit the complaints, coordinate collecting statements, obtain documents, and so forth. Although this is not B’Tselem’s job but the responsibility of the military system, we have elected to perform it for the last 25 years for a variety of reasons. One of the reasons we did so was that we hoped that in this way we were helping bring justice to the Palestinian victims and to establish deterrence that would prevent future similar incidents. If that had been the outcome, this paper would not have been written. In reality, however, B’Tselem’s cooperation with the military investigation and enforcement systems has not achieved justice, instead lending legitimacy to the occupation regime and aiding to whitewash it. B’Tselem will no longer play a part in the pretense posed by the military law enforcement system and will no longer refer complaints to it. The experience we have gained, on which we base the conclusions presented in this report, has brought us to the realization that there is no longer any point in pursuing justice and defending human rights by working with a system whose real function is measured by its ability to continue to successfully cover up unlawful acts and protect perpetrators. We will continue to document and report on Israel’s human rights abuses in the occupied territories, but we believe that the task of advancing human rights protection in the occupied territories will not be served by efforts to help shoddy investigations that would, in any case, end up being much watered down by MAG lawyers. The fight for human rights will be better served by denouncing this system and exposing it for what it is. In its Weekly Report On Israeli Human Rights Violations in the Occupied Palestinian Territories for the week of 12 – 18 May 2016, the Palestinian Center for Human Rights (PCHR) found that Israeli forces continued to use excessive force in the Occupied Palestinian Territories. 7 Palestinian civilians, including 2 children, were wounded in the West Bank and Gaza Strip. Israeli forces conducted 57 incursions into Palestinian communities in the West Bank. 36 civilians, including 5 children, were abducted. 8 of them, including a child, were abducted in occupied Jerusalem. Among the abducted was a PLC member and the former Minister of Prisoners. On 15 May 2016, Israeli forces opened fire at 32-year-old male while attempting to sneak into occupied Jerusalem, heading to his workplace. As a result, he sustained a bullet wound to the head. His injury was classified as moderate. 3 houses were demolished in al-Sowana neighbourhood and Shu’fat village, leaving 30 civilians homeless. Concerning house demolitions, on 17 May 2016, Israeli municipality bulldozers demolished 2 houses in al-Sowana neighbourhood, east of Jerusalem’s Old City in application of the Central Court’s decision to demolish the 2 houses for being built on lands classified as “National Parks” without license. On 18 May 2016, Israeli forces demolished a house belonging to Rajeh Hawareen in Shu’fat village, north of occupied Jerusalem for the interest of establishing a settlement road. It should be noted that the house was built in 2001 and used to shelter a 7-member family. Israeli forces turned the West Bank into cantons – dozens of temporary checkpoints were established in the West Bank and others were re-established to obstruct the movement of Palestinian civilians. 13 Palestinian civilians, including 2 children and a woman, were abducted at military checkpoints in the West Bank. In the Gaza Strip, in the context of the use of forces against peaceful protests, 3 Palestinian civilians, including a child, sustained bullet wounds to the lower limbs while participating in peaceful protests near the border fence between the Gaza Strip and Israel, east of al-Bureij. The wounded were taken to al-Aqsa Martyrs’ Hospital to receive the necessary medical treatment. In addition, 2 of them were transported to Shifa Hospital in Gaza City. Concerning targeting border areas, on 18 May 2016, Essa al-Ejla (19), sustained a bullet wound to the right leg when Israeli forces stationed at the border fence, east of al-Shuja’iya neighbourhood, east of Gaza City, opened fire. The aforementioned person was working in his farmland that is about 500 meters away from al-Muntar (Karni) crossing. In the context of targeting Palestinian fishermen in the Gaza Strip Sea, on 12 May 2016, Israeli gunboats opened fire at Palestinian fishing boats, northwest of Beit Lahia, north of the Gaza Strip, but no casualties were reported. On 15 May 2016, Israeli gunboats opened fire at Palestinian fishing boats sailing off Beit Lahia shore, north of the Gaza Strip. Three Israeli gunboats surrounded 10 fishing boats, including 3 children, all from al-Remal and Shati’ refugee camp, west of Gaza City. Israeli navy officers abducted all of them and took them to Ashdod seaport, in addition, confiscated 2 fishing boats and drowned a third. The next day, Israeli forces released 8 fishermen and kept 2 others In custody. On the same day also, Israeli gunboats stationed off Deir al-Balah shore in the Central Gaza Strip, opened fire around fishing boats, but no casualties were reported. On 16 May 2016, Israeli gunboats stationed off Beit Lahia shore, north of the Gaza Strip, opened fire at fishing boats. A gunboat approached a fishing boat manned by 2 fishermen. The Israeli navy forces abducted both of them and confiscated their boat. The illegal closure of the Gaza Strip, which has been steadily tightened since June 2007 has had a disastrous impact on the humanitarian and economic situation in the Gaza Strip. The Israeli authorities impose measures to undermine the freedom of trade, including the basic needs for the Gaza Strip population and the agricultural and industrial products to be exported. For 9 consecutive years, Israel has tightened the land and naval closure to isolate the Gaza Strip from the West Bank, including occupied Jerusalem, and other countries around the world. This resulted in grave violations of the economic, social and cultural rights and a deterioration of living conditions for 1.8 million people. The Israeli authorities have established Karm Abu Salem (Kerem Shaloum) as the sole crossing for imports and exports in order to exercise its control over the Gaza Strip’s economy. Israeli settlers, accompanied by soldiers, continued to assault Palestinian civilians and property this week. About 30 olive trees were burnt at the eastern entrance to Kufor Qaddoum village, northeast of Qalqilya. In a separate incident, at approximately 10:00 on Wednesday, 18 May 2016, Israeli forces accompanied with two military jeeps and a vehicle belonging to the Construction and Organization Department in the Israeli Civil Administration moved into Beit Ommar village, north of Hebron. They patrolled in the streets of Beit Z’atah, al-Furaidas, Thughret al-Shabak area and the northern areas of the city. The Civil Administration officer handed 4 civilians notices to stop building water tanks built of concert and tin in order to collect water for agriculture. Those water tanks were built in the beginning of 2016 as part of a program to develop Water Resources for marginalised lands in the West Bank funded by the European Union and implemented by the Palestinian Hydrology Group and Agricultural Work Committees Union. In the West Bank, regarding the use of forces against peaceful protests, 2 Palestinians were wounded while participating in Kufor Qaddoum weekly protest, northeast of Qalqilya. The first (18) sustained a bullet wound to the left leg and the second (26) sustained a sponge-tipped bullet to the head. Moreover, a child (15) sustained a bullet wound to the right knee while participating in a protest around “Psagot” settlement, east of Ramallah, marking the Nakba Day. During those protests, Israeli forces abducted Abdullah Abu Rahma (43), coordinator of the popular committee against the annexation wall and settlement activities in Bil’in village, west of Ramallah, and an Israeli activist. Moreover, as a result of Israeli forces firing sound bombs and tear gas canisters, about 30 olive trees at the eastern entrance to Kufor Qaddoum village, northeast of Qalqilya. In its Weekly Report on Israeli Human Rights Violations in the Occupied Palestinian Territories for the week of 04 – 11 May 2016, the Palestinian Center for Human Rights (PCHR) found that Israeli forces continued systematic crimes in the occupied Palestinian territories. In the Gaza Strip, a Palestinian woman was killed and 2 others, including a child, were wounded as Israeli warplanes carried out 10 airstrikes. 6 Palestinian civilians, including 2 journalists, were wounded in the West Bank. 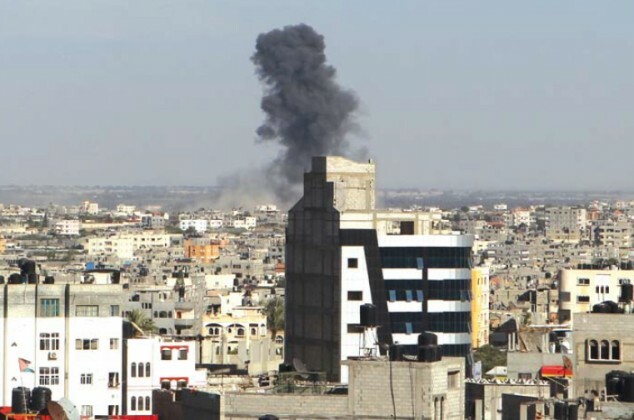 During the reporting period, Israeli forces carried out 10 airstrikes and at least 8 shelling incidents against Palestinian armed groups’ sites and agricultural areas in the Gaza Strip’s border area. As a result, a Palestinian woman was killed and 5 others, including a child, were wounded. Six of them, including 2 journalists and a mentally disordered person, were wounded in the West Bank. In the Gaza Strip, in new killing crime resulting from random shelling and excessive use of force, on 05 May 2016, Israeli forces killed Zana Atiya Mohammed al-Emour (59) and wounded one of her relatives namely Amir al-Emour (16) due to a shelling attack that targeted the land in which they were working in the east of al-Fokhari village, east of Khan Yunis, south of the Gaza Strip. On the same day, Khzaima al-Farra (21) sustained shrapnel wounds to the legs while harvesting wheat near a landfill, east of Khan Yunis, south of the Gaza Strip, when Israeli forces opened fire at agricultural lands in al-Fokhari area. Concerning airstrikes, on 04 May 2016, Israeli warplanes carried out 2 airstrikes in Rafah. On 05 May 2016, Israeli warplanes carried out 5 airstrikes on Palestinian armed groups’ sites in the northern and southern Gaza Strip. As a result, a civilian and 2 members of armed groups sustained minor wounds. On 06 May 2016, Israeli warplanes fired a missile at an agricultural land about 800 meters away from the border fence between the Gaza Strip and Israel, east of Khuza’a village, east of Khan Yunis, south of the Gaza Strip. No casualties were reported. On 07 May 2016, Israeli warplanes carried out 2 airstrikes; only 10 minutes between them, in agricultural lands in Abassan village, east of Khan Yunis, south of the Gaza Strip. In the context of targeting the border area, on 04 May 2016, Israeli forces stationed at the border fence, east of Khan Yunis, fired a number of shells that landed around a field control site in al-Fokhari area, southeast of the city. Moreover, they fired shells at Palestinian armed groups’ outposts in al-Shouka village, east of Rafah, south of the Gaza Strip. No casualties were reported. On 05 May 2016, Israeli forces stationed at the border fence carried out 5 shelling attacks against Palestinian armed groups outposts and agricultural lands in al-Shouka village, east of Rafah; Palestinian armed groups’ watchtowers, east of Khan Yunis, south of the Gaza Strip; and agricultural lands, north of Beit Hanoun, north of the Gaza Strip. On 06 May 2016, Israeli forces fired a number of shells at the eastern part of Khuza’a village, east of Khan Yunis, south of the Gaza Strip. No casualties were reported also. In the context of targeting Palestinian fishermen in the Gaza Strip Sea, Israeli gunboats stationed in the sea off Beit Lahia shore, north of the Gaza Strip, opened fire at Palestinian fishing boats. A gunboat approached a fishing boat and then abducted Uranus al-Sultan (19) and Mohammed al-Sultan (23), both from al-Atatrah neighbourhood in Beit Lahia. Israeli forces confiscated the fishing boat and released the 2 fishermen at 00:30, the following day. In the West Bank, on 05 May 2016, Israeli forces wounded Arif Jaradat (22), a mentally disordered person, with a bullet to the left side of the belly while moving into the southwest of Sa’ir village, east of Hebron. The bullet was fired from a distance less than 10 meters while the aforementioned person was shouting at the Israeli soldiers without posing any threat to them. Moreover, there were no confrontations in the area. Concerning the use of force against peaceful protests, 3 Palestinian civilians were wounded during Kufor Qaddoum weekly protest, northeast of Qalqilya. Among the wounded were 2 journalists. On 07 May 2016, Israeli forces opened fire at a Palestinian civilian from Beit Ommer village, north of Hebron, while attempting to enter East Jerusalem via the annexation wall in Hummos valley area in Sour Baher village to get to his work. As a result, he sustained a bullet wound to the leg and was then transported to al-Hussein Hospital in Beit Jala for medical treatment. In the context of seizure of Palestinian lands and property by settlement organizations, on 09 May 2016, Israeli settlers seized a building in al-Sa’diya neighbourhood in the Old City of East Jerusalem. The 3-storey building is located 200 meters to the north of al-Aqsa mosque. It used to be occupied by Ozbashi family that suddenly left. On the same day, Israeli forces moved into a 3-dunum plot of land in Shaikh Jarrah area, north of East Jerusalem. 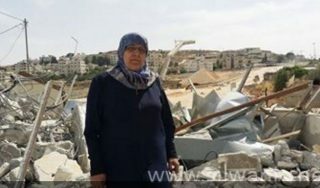 They confiscated the land that belongs to Mohammed Abu Ta’ah and handed it over to a settlement organization without a court order although the court has been considering the case. It should be noted that Israeli forces and settlers have been attempting to seize this plot of land for about 30 years. Besides, there has been a case filed before the court for 27 years and no court ruling was issued in this regard. However, the settlers used to move into the land now and them. A month ago, the settlers moved into the land and started construction. On 09 May 2016, Israeli forces demolished an under-construction house in al-Walaja village, northwest of Bethlehem. They already sent the owner of the house a notification to halt construction works a week ago. In the same context, on 04 May 2016, 3 settlers, who present in the vicinity of the Ibrahimi mosque in the centre of Hebron, attacked Ra’ed Abu Rmaila (44) when he was going home along with 2 neighbours. As a result, he sustained bruises to the neck and a minor wound to the head. He was then transported to Hebron Governmental Hospital. On the same day, hundreds of settlers escorted by Israeli forces moved into Kafel Hares village, north of Salfit. They visited religious tombs in the village and performed their rituals on the occasion of the Jewish Passover. The settlers withdrew in the early morning. On 07 May 2016, a settler from “Ramat Yishai” settlement outpost in Hebron attacked Emad Abu Shamsiya (45), from Tal al-Rumaida neighbourhood. Abu Shamsiya was attacked while filming some settlers attacking Palestinians in the neighbourhood. As a result, his camera was broken. On 09 May 2016, a group of settlers moved into “Tarsala” settlement, south of Jenin, which was evacuated in 2005. A local source said to PCHR’s fieldworker that the settlers were escorted by Israeli forces. They stayed for a while performing Talmudic rituals and withdrew later. Following the Friday prayer, on 06 May 2016, dozens of Palestinian civilians organized protests against the Israeli policies in the Occupied Palestinian Territories at the western entrance to Silwad village, northeast of Ramallah, in the vicinity of “Ofer” prison, southwest of the city and at the entrance to al-Jalzoun refugee camp, north of the city. Israeli forces used force to disperse the protestors by firing live bullets, rubber-coated metal bullets, tear gas canisters and sound bombs. As a result, many civilians suffered tear gas inhalation and others sustained bruises as Israeli soldiers beat them up. At approximately 18:00, on the same day, dozens of Palestinian young men gathered in al-Naqar neighbourhood, west of Qalqiliya, and threw stones at Israeli forces stationed at the annexation wall. Israeli forces fired sound bombs, tear gas canisters and rubber-coated metal bullets at the protesters in response. As a result, a 20-year-old male was hit with a rubber-coated metal bullet to the left eye and was then taken to Dr. Darwish Nasal Hospital to receive medical treatment. Moreover, Israeli forces abducted Mohammed Abdul Latif Ji’ady (18) and took him to an unknown destination. At approximately 13:00, on Friday, 06 May 2016, Palestinian civilians and Israeli and international human rights defenders organized a protest in the center of Kufor Qaddoum village, northeast of Qalqiliya, and then made their way to the eastern entrance of the village in protest against closing that entrance since the beginning of al-Aqsa Intifada with an iron gate. When the protesters approached the entrance, Israeli forces fired live bullets, rubber-coated metal bullets, tear gas canisters and sound bombs at them. Ahmed Abdul Malek Othman Shawor (29), a reporter at Palestine T.V, was hit with 2 rubber-coated metal bullets to the left hand and leg. Almuthana Samir Abdullah Deek (27), a cameraman at Trans Media Company, was hit with 4 rubber-coated metal bullets. Two of them hit the right leg while the two others hit the left hand. Following the Friday prayer also, dozens of Palestinians and Israeli and international human rights defenders organised protests against the annexation wall and settlement activities in Bil’in and Nil’in villages, west of Ramallah and al-Nabi Saleh village, northwest of city. Israeli forces used force to disperse the protesters by firing live bullets, metal bullets, tear gas canisters and sound bombs and chased the protesters into the olive fields and between houses. As a result, many civilians suffered tear gas inhalation and others sustained bruises as Israeli soldiers beat them up. Due to the number and severity of Israeli human rights violations this week, the PCHR made several recommendations to the international community. Among these were a recommendation that the United Nations provide international protection to Palestinians in the Occupied Palestinian Territories, and to ensure the non-recurrence of aggression against the Occupied Palestinian Territories, especially the Gaza Strip.